Less than an hour’s flight from the eclectic enigma of Bangkok is Samui, known for its castaway vacation vibe. But this island also possesses another enticing energy that comes from the island’s folk stories, supernatural beliefs and spiritual symbolism. Crystal clear waters lap at the whitest sand beaches of Samui set against year-round sunshine and blue skies. 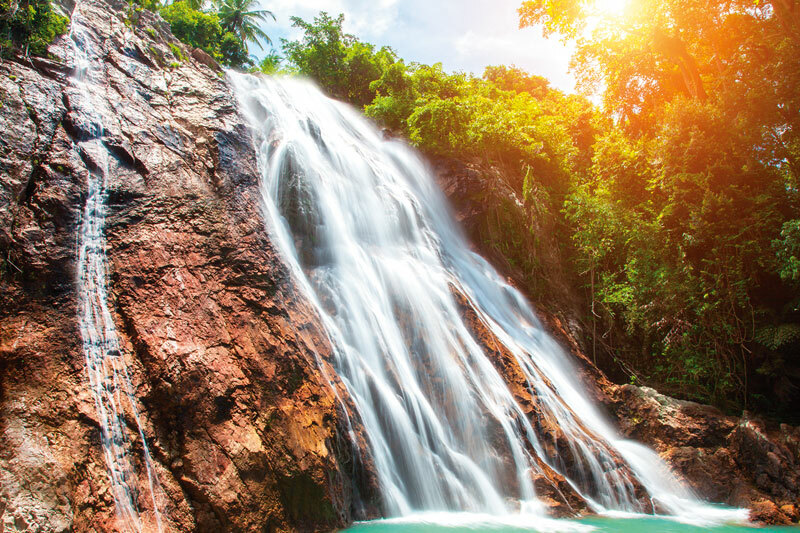 Nearby are 42 islands of Ang Thong Marine National Park and part of the largely uninhabited islands of Chumphon Archipelago: Koh Samui is set in a spectacular landscape that simply inspires. And there is something otherworldly and ethereal about Thailand’s third largest island that reverberates with the very core of your inner being, with places echoing the heart and soul of Buddhist spiritualism and Thai culture. One such place is the Magic Garden that takes you off the beaten path and into a hillside jungle. Hidden away, this private oasis of incredible stone sculptures was apparently inspired by the owner of the land, a durian farmer, who founded a waterfall at the beauty spot. In his 70s at the time, some 40 years ago, he decided to spend 15 years creating a mystical garden to teach people about the afterlife. The human, animal and deity depictions of classic Thai folk stories are mesmerising and wonderfully soulful. 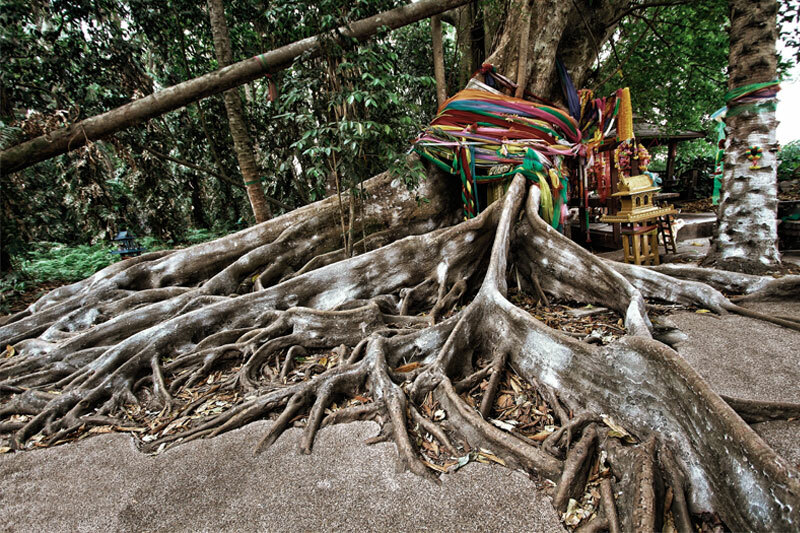 Elsewhere on the island, trees where spirits are also believed to reside are protected with colourful ribbons. Silk outfits are left hanging from spirit tree branches as a gift to the female guardian tree spirits, Nang Mai and Nang Takian. At Na Muang Waterfall, one part of a spirit three resembles a serpent (naga), a symbolically important animal in Thai folklore and Buddhist teachings, and has been honoured with ornate decorations. 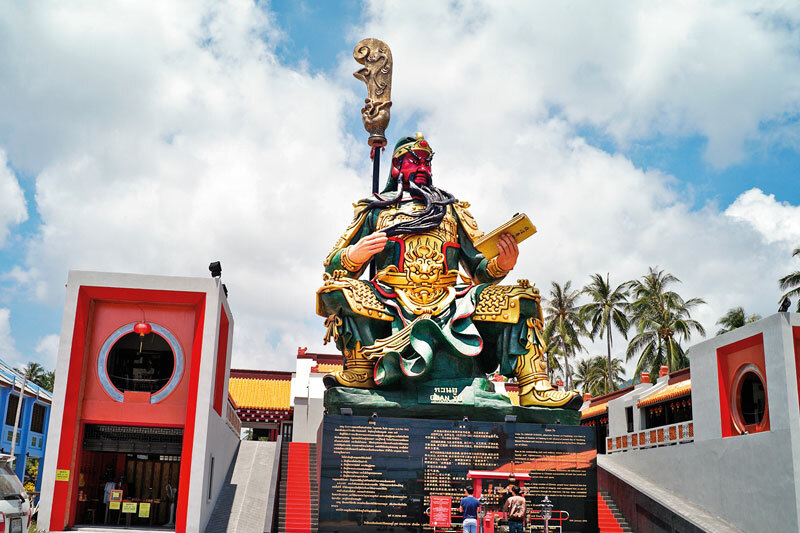 It is believed a cobra sheltered Buddha from a storm as he meditated and Thai legend tells of a snake requesting to change into a man to enter the monkhood. Grandparents on their way to ask the parents of their grandson’s paramour for her hand in marriage are caught in a storm, another Samui legend relates. Shipwrecked, they perish and turn into stones, Hin Ta and Hin Yai (Grandfather Rock and Grandmother Rock) as a continuing pledge to their mission. The rocks resemble the intimate regions of a man and woman and the story adds some folklore charm to the visually interesting rocky scene. 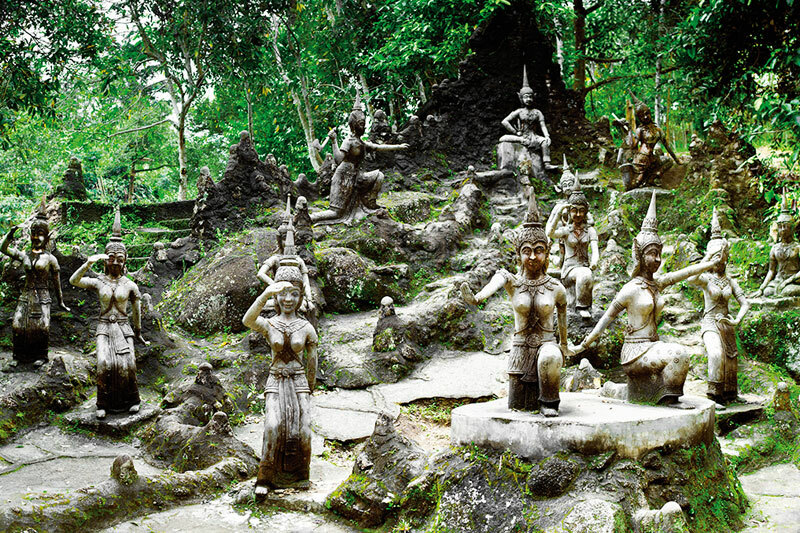 Whether elaborate make-believe or not, the table demonstrates how animism underpins Buddhist beliefs in Thailand: that stones, rivers and trees have souls.